Being firmly entrenched in the Texas Hill Country, there was for me, some mystery about the wineries and wines of North Central Texas, that area north of Fort Worth and Dallas. 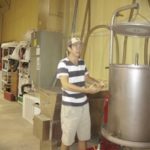 I had heard many good reports about the wines coming from this area south of Red River and Lake Texoma, and curiosity pushed me into scheduling a road trip. Through the connection that 4.0 Cellars has with Lost Oak Winery in Burleson, I was provided with a great starting point. And in Laurie Ware, Lost Oak Wine Club Member extraordinaire, I had a great wine and travel guide. So, I ventured north from Fredericksburg in August for a long weekend into mostly unknown wine territory. It was a pleasant four-hour drive through miles and miles of scenic Texas to my first stop on Thursday, the familiar surroundings of Lost Oak Winery, located at 8101 County Road 802, just south of Burleson, TX. I visited the spacious tasting room with two indoor sections. To the west side of the tasting room, is a sliding glass door that leads out to a large covered patio near the creek where some amazing Thursday night gatherings and weekend wine tastings are held. Just a bit further to the west, the former winery building has been greatly expanded into a large and classy events center with plenty of room for weddings, anniversary, or birthday celebrations, fully equipped with restrooms, changing salons, and a first-class caterer’s kitchen. With the upgrade of this facility, new space for the winery was required. So, at the back of the property, new space has been built to house tankage, barrel storage, and a crush pad. When you add in the various vineyard blocks near these facilities, Lost Oak Winery provides a lovely and inviting place for Texas wine lovers to gather and enjoy good wines and fun times. Prior to embarking on my trip northward, several early discussions had hatched a plan to meet at the winery building where head winemaker Jim Evans was working with his crew on the most recently delivered batch of Merlot grapes. We stopped in and helped with (well, mostly watched and distracted everyone) from a delestage treatment of the Merlot must. This process first separates juice from skins/seeds, and then recombines with a generous dose of air (oxygen) contact, which helps to invigorate the fermentation yeast cells and provide a bit of mellowing influence to the tannins being extracted from the skins. Of course, we had to taste the Merlot being treated, and the prognosis is very positive. After the delestage exercise, we proceeded to taste a number of wines from tank and barrel. 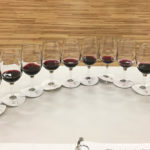 My focus was on the 2015 Cabernet Franc that had spent time in an American oak barrel which I acquired at the silent auction during the last Texas Wine and Grape Growers Association (TWGGA) meeting and trade show in Frisco, TX (Feb-2016). The wine was very tasty, and it was a real treat for me to see that the barrel had been labeled with a special brass plate signifying “Carl Hudson.” The folks at Lost Oak Winery have always treated me very special, and the wine they put in “my barrel” was also very special. 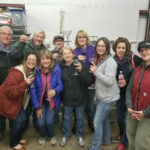 The group spent about two hours at the winery, mostly visiting, but also sampling 2015 vintage wines from barrels and tanks, and some of the newly fermented 2016 vintage wines from tankage. About 5:30, several of the folks at the winery retreated to the home of proprietors Judy and Gene Estes, which sits at the back of the beautiful Lost Oak Winery property. There, a number of covered dishes prepared for a picnic-style supper were set out near the spacious dining room of the Estes’ home. The original plan was to eat outside, but the event was moved inside primarily due to the hot and humid conditions of August. Eventually 11 people gathered at the table to share the picnic supper and wonderful wines that would be opened over the course of the evening. For the sake of full disclosure, not all the wines opened were from Texas. 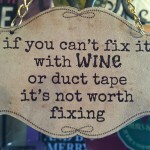 But we shared some fun ones from the cellars at Lost Oak Winery, including the following. Everyone certainly enjoyed the afternoon and evening at Lost Oak Winery. We parted with fond goodbyes and lots of hugs. My focus was on getting a good night’s rest to prepare for the following day’s adventure, which would include visits to three quality wineries located northwest of Fort Worth. After reaching the hotel, it did not take long to fall fast asleep with dreamy visions of wine grapes and oak barrels. The drive took us northward on I-35 E through Burleson and Ft. Worth. U.S.-81 veered off to the northwest taking us through Rhome and Decatur to the location of our first stop at Marker Cellars, 1484 CR-2585, Alvord, TX. It was a most interesting drive from Alvord out to Marker Cellars through bluestem grass country that is part of the LBJ National Grasslands. This beautiful Texas prairie area surrounds the winery. It was neat to see the artistic rendition of tall bluegrass stems incorporated into the Marker Cellars label designs. After the official tasting, we walked through the small production area behind the tasting room and into the covered crush pad/outdoor tasting area. This was a neat part of the main building that had large lift doors on opposite sides that could be raised to accommodate either wine making efforts or outside tasting events. 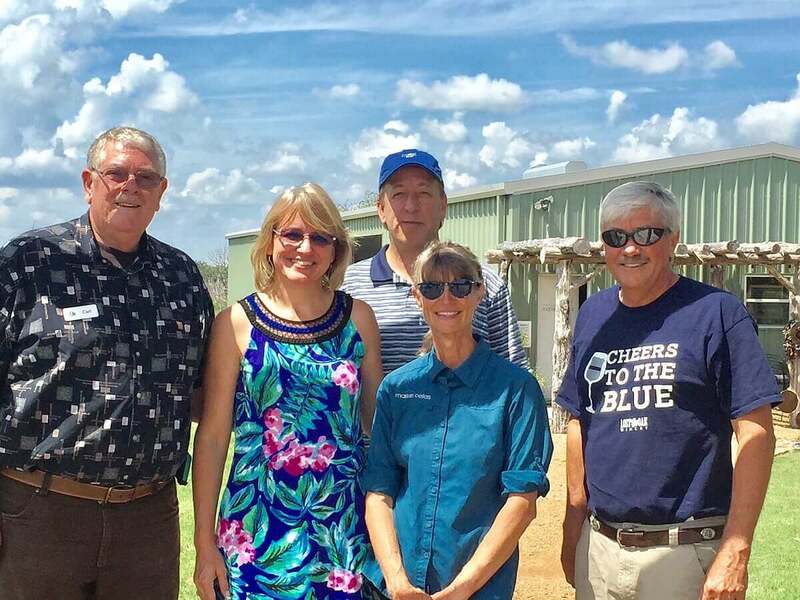 The view of the bluestem grasslands was lovely, and the corrals for the horses that Becky Rogers keeps at the farm were just a short distance away. All in all, it was a most relaxing and beautifully pastoral setting. As we were leaving the winery building, we were treated to a taste of the most recent vintage Syrah from tank. It was dark, cloudy (of course), and full of black plum aromas and flavors with a nice spicy, almost peppery note on the finish. This will certainly be a wine to keep in mind for the future. Goodbyes and hugs were in order as we gathered for a final photo in front of the gateway. The four of us piled into the vehicle and waved to Becky and Margaret as we headed back through the bluestem grasslands on the way to stop number two – Blue Ostrich Winery & Vineyard in Saint Jo. After departing Alvord, we drove northeast through the small village of Forestburg on TX-1655, and stopped at a classic Texas general store/burger joint to order old-fashioned burgers grilled on a flat-top. The burgers were ordered to-go with the plan to eat lunch under the spacious Blue Ostrich pavilion. 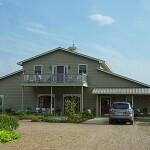 Blue Ostrich Winery & Vineyard is owned by the Whitehead family, Patrick and Julie, and their daughter, Presley. 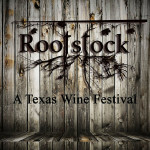 The winery, vineyard, and tasting room is located 8.5 miles north of Saint Jo at 5611 FM-2382 in Cooke County, TX. Patrick is the head winemaker and grape grower, and is ably assisted by Presley, who recently spent time in winery operations in California. Julie manages the tasting room and keeps everybody on the right track. For many years, this farm was an ostrich breeding and ranching facility. The winery and tasting room were converted from the structure that once housed eggs, chicks, and fledglings. The scenic hillside area behind the winery was once populated by hundreds of blue ostrich in the 1980s-90s. Today, beautifully manicured grapevines, mainly Tempranillo, Viognier, and Cabernet Sauvignon populate this hillside. Several of the magnificent birds still reside near the tasting room and serve as official winery mascots. Blanc du Bois 2014 – fruit sourced from Skinner Bridge Vineyard near Van, TX. Fruit-driven aromas and flavors, crisp acidity, and long finish. Viognier 2015 Estate – beautiful floral/honeysuckle aromas with notes of pineapple and lychee, rich feel on the palate with a robust, balanced finish. Seven Brides Dry Rosé – mostly estate fruit from their experimental row of grapevines, includes seven different varieties, clean, cherry/berry fruit aromas and flavors, crisp and clean with a fun, lively finish. Dolcetto 2014 – fruit sourced from young vines in Oswald Vineyard in Terry County. Very pleasant lighter-bodied red with cherry notes and a tingly finish. Tempranillo 2014 – Due to limitations in time and space at harvest, this fruit from Bishop Vineyards in Childress, TX, was originally frozen in bins at a commercial freezer unit. This step of freezing fruit causes grape cell walls to break down easier and provide a bit more fruit flavor extraction during the fermentation process. Once thawed, the grapes were processed and fermented, then barreled for nine months in American oak. The initial aroma was of burnt/caramelized sugar, which dissipated over time to reveal more normal oak notes of smoke, vanilla, and butter cream. Solid black cherry and toasted nut flavors with a deep, long finish. Very nice. Talon 2014 – This deep, rich red was absolutely delicious. Fruit sourced from Bishop Vineyards in Childress, TX. The Tempranillo grapes in the blend (62%) had been frozen (see above). The rest of the blend, if remembering correctly, was Sangiovese (32%) with some Merlot and Petite Sirah. This was big, dark, and really good – think steak wine. Cabernet Sauvignon 2014 Estate – This was elegant and full-bodied with black currant fruit, toasted oak, fine cigar tobacco, and hints of tea leaf and mocha – a very good effort for Texas Cabernet Sauvignon. I purchased a bottle to add to my cellar. After the tasting, we gathered under the large pavilion to partake of the hamburgers ordered earlier. They were quite tasty in an old-fashioned style, but would have been even better had we eaten them earlier when they were warmer. However, we had a great time visiting and tasting with Julie. She joined us at the table and related more of the history of the ostrich farm and family connections to the land. One could hardly ask for a more pleasant lunchtime visit. After the burgers, we enjoyed an ATV ride through the vineyard with Patrick. At this time in August, most of the red fruit was hanging beautifully, ripening in the afternoon sun. 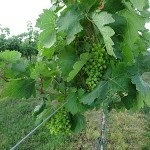 These well-manicured vines certainly showed that they were part of the process of producing fine Texas wines at Blue Ostrich. The view through the vines down the long, west-facing hillside was beautiful – just what you see from the pavilion. Chardonnay 2015 – from vines planted in 2012. This was a terrific and absolutely delicious Chardonnay (my favorite grape). The wine was fermented in a Flextank and remained in the Flextank to undergo secondary malolactic fermentation and age with French oak wood staves. This was certainly my kind of Chardonnay – lovely fruit aromas and flavors, good oak aromas with butter and cream notes, and finely tuned acidity to balance the wine perfectly. Needless to say, I purchased several bottles of this wine to carry back to the Hill Country. Roussanne 2012 – fruit sourced from the Oswald Vineyard on the Texas High Plains. This was big, rich, golden in color, kind of earthy with soft woody notes – very tasty. This was a Double Gold medal winner in San Diego. Rosé 2015 Estate – a 50/50 blend of Syrah and Cabernet Sauvignon. The Cabernet Sauvignon was directly pressed while the Syrah underwent saignée. Saignée, which roughly means bleed in French, is the process by which a portion (usually 10-15%) of juice is bled off from a tank of crushed red grapes. This juice will be pink or light red in color, and makes a great starting point for rosé wine. Following saignée, the remaining grape must in the tank has a higher skin-to-juice ratio and can produce a darker, more tannic and overall more flavorful red wine. This 2015 Rosé was soft pink in color, lively, bright in aromas and flavors, and overall very tasty. Sweet Texas Rosé – This was essentially the same wine as above finished with 3.5% residual sugar. It smelled the same, had the same color and mouthfeel, but with a very pleasant level of sweetness. Ryan’s Red 2014 Estate – This blend of Cabernet Sauvignon (76%) and Syrah (24%) was dark, dusky with lots of black plum, cherry, and currant fruit aromas and flavors. This stand-up red was produced in Flextank with French oak staves. Ryan’s Red 2015 Estate – This blend of Cabernet Sauvignon (34%) and Syrah (66%) was even better with more pronounced fruit aromas and flavors, strong notes of smoke and plenty of ripe, grippy tannins on the finish. This looks to be a great option for cellaring 5-10 years. Again, it was produced in Flextank with French oak staves. Tempranillo 2014 – fruit sourced from Bishop Vineyards in Childress, TX – same batch of frozen fruit mentioned earlier with the Blue Ostrich 2014 Tempranillo. This was exciting with great depth of dark cherry fruit, nicely balanced oak notes (cream, smoke, and butter), with a long, enticing finish, again with grippy tannins. A bottle of this also made the trip back to the Hill Country. Syrah 2014 Estate – This seemed to have all the classic characteristics of a good Syrah – campfire smoke and roasted meat aromas, loads of black plum fruit on the palate, toasty, and rich on the finish with solid, but ripe tannins. A very good effort with Syrah. Syrah 2015 Estate – This was quite similar to the 2014. It was younger, more fruit driven and may be, overall, a better wine. A bottle of this will sit in my Hill Country cellar awaiting the appropriate occasion to open a big, rich Syrah. Overall, the Arché wines were stellar, as my friend Bill Kreitz likes to say about top-quality wines. 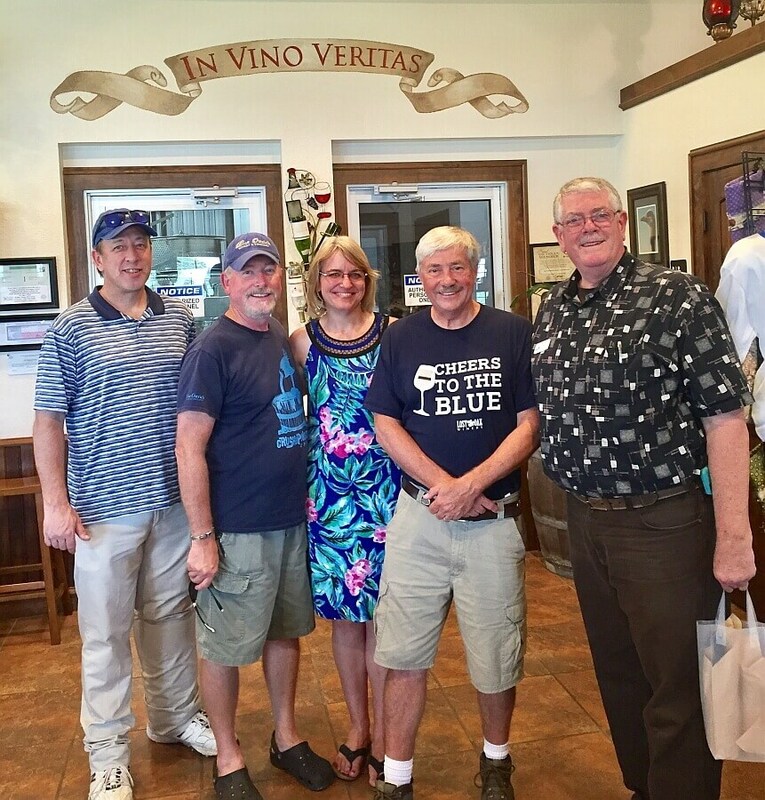 Our tasting was certainly a success, and all of us made sure to express our appreciation of the grape growing and wine making talents of Amy, Howard, and Grayson. After the tasting, Howard and Amy led us on a vineyard tour. Howard began to discuss the various plantings and methodology for managing growth, pruning, and canopy. Perhaps the most interesting part of the discussion related to their cane pruning method that pulled two canes to each side of the trunk. The goal was to leave more buds for greater fruit production than could be provided via typical cordon pruning where only the first two or three buds at each junction would be left. Howard is convinced that the first two buds at each site are the least productive, and by laying over the canes with buds 3, 4, and 5+, more fruit can be produced. Jim Evans and I certainly took in all the information being provided, and began to consider experiments to evaluate this methodology for the 2017 growing season. 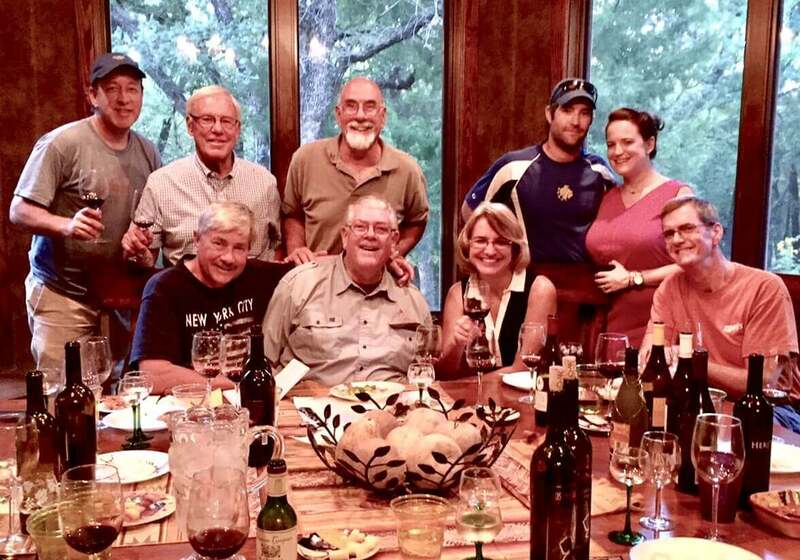 It was finally time to call it a day – a great Texas wine day. We said our goodbyes to the Davies family, and once again loaded into the vehicle for the trip back to Burleson. On the way, we stopped at a wonderful, and very busy Mexican restaurant in Decatur. The wait to order and receive our food was surprisingly short considering how busy the place was. The food was quite good, and some cold beer really hit the spot after a long day of wine tasting. The drive back to Burleson was uneventful and everyone was on their way home to bed by 10:00 pm. Be sure to read Part 2 next! As usual it was a great report. Thanks Carl.